Deere’s model 4020 was a stunning success, no matter how you look at it. The 4020 started from the lead that Deere already had in the market and built upon it by offering more features and more power. Of course, the tractor did not come cheap, but compared to similar tractors from other manufacturers it was very competitive. Still, IHC, the company that had been number two in sales since Deere released the New Generation tractors and a perennial thorn in Deere’s side, were beginning to make improvements to their tractors, and were slowly gaining ground on Deere by offering a few more horsepower in their tractors at a lower cost than Deere could. Examining the situation, Deere looked at their lineup and realized that there was a large gap of 25 horsepower and almost $2000 between their own 3020 and 4020. A few options were available to Deere to fill this gap and get back some of the customers that they were losing to competitors. One of the first was to improve the output of the 3020. The problem with this idea was that some of the power-bearing parts of the tractor and its engine would need to be strengthened to reliably harness that power. This would have required Deere to redesign, reengineer, and retool the 3020, wasting a lot of time and costing quite a bit of money while reducing Deere’s ability to offer more power at a lower cost and keeping them from bringing it to market as soon as they would like. Another option was to take the 303 cubic inch six cylinder engine built by the Dubuque Works and to install it on a 4020 chassis. These engines were capable of about 80 horsepower or more, which would put the tractor nicely between the 3020 and 4020, and it fit well on the chassis. Deere tried this out on a test tractor, and it apparently worked fairly well. The problem with this solution, though, was that the Dubuque engine was a bit expensive, and would also incur the added expense of shipping them to Waterloo. Finally, Deere came to the idea of modifying the 4020 to make it lighter and cheaper. Minimizing the features on the tractor could substantially lower the price, and the farmer would benefit from having the same basic capabilities as the full-spec 4020. This option had obvious merit. Besides using a chassis and engine combination that was proven and popular, Deere would not have to spend any money tooling up to build it, they would not have to make any major changes in the assembly line when they added the tractor to it, and the resulting tractor would be capable of about the same amount of power as the IHC 806 while priced competitively. This was the direction that Deere headed in, and the John Deere model 4000 was born. The one thing that Deere did not want to change when they created the 4000 from the 4020 was the engine. The six cylinder, 404 cubic inch engine produced over 91 horsepower at the PTO, and was quite efficient, as well, as its economy rating put it very near the top of its class. Not only was this engine capable, but it was also field-tested and proven, it brought a cachet that would look good in the eyes of the potential buyer, and it was one less thing that the engineers had to modify for the tractor, which would save Deere money right away and on every model 4000 built. Deere did make one concession regarding the engine, however. While the 404 cubic inch diesel engine was available for the 4000, the gasoline and LP-gas engines that some buyers installed on their 4020 was not made available for the 4000. This fact probably reflected anticipated demand and also kept the spec sheet for the 4000 a bit shorter. The transmission was simplified somewhat for the 4000. The Syncro-Range transmission in the 4020 had synchronizers in the reverse gear to allow the operator to shift from forward to reverse without stopping. The Syncro-Range in the 4000 had no reverse gear synchronizers; instead, it had a collar shift design. This meant that an operator had to come to a complete stop before they could shift from forward to reverse or vice-versa. This was probably a fairly minor inconvenience for most people, and farmers who had never used a 4020 likely would not have noticed the difference. These Syncro-Range transmissions were simpler and cheaper to build, and were just one step to the low price of the 4000. They also would have appealed to any farmer who did know the difference, because they were less expensive to service and rebuild than the fully synchronized version. This transmission turned out to be quite successful, and Deere used the units on tractors with Syncro-Range transmissions into the 1980s. Another change in putting the power to the ground was in the tires. Standard rubber on the 4000 included 9.5×15 inch front tires and 16.9×34 inch tires in the rear. Compared to the 4020, these tires made the 4000 sit one-half-inch lower to the ground. This was another minor change that kept the price of the 4000 just a bit lower. The electrical system of the 4000 probably received more alterations than did any other part of the machine. The alternator was reduced in size and capacity from 55 amps to a 35 amp Motorola model. The fiber optic-lit gauges of the 4020 were eliminated and replaced with simpler, cheaper gauges and a straightforward dash panel light. There was no dial next to the speed-hour meter that allowed the current gear to be chosen to find the tractor’s speed. Instead, the double needle on the tachometer pointed both to the current engine speed and the range of speeds that you could be traveling depending on what gear you were in. Only one light adorned the front of each rear fender. This saved money but made night operation a little less comfortable. For those used to the look of the 4020, the 4000 looked a little bit like something was missing in the spot where the absent lights belonged. Another spot on the 4000 that looked like it was missing something was the location of the batteries. To again save a few dollars, Deere got rid of the cover that protected the batteries and left just a tray and a frame to hold the batteries down. This left a bare bones look, but it left fewer places for battery acid to accumulate around the battery, which often led to corrosion in the sheet metal on 4020s. On the other hand, rocks and debris could be thrown up into the batteries, possibly damaging them. At the back end of the tractor, the 4000 differed from the 4020 in a couple more ways. A dual speed PTO was available at the back of the tractor, but, unlike the 4020, no mid-mounted PTO could be installed on the 4000. The three-point on the 4000 was a lower capacity version and lighter than that on the 4020. Also, some of the sheet metal around the seat and on the back end was different, or eliminated entirely. The buyer had the option of exchanging 15.5-38 inch tires for the standard 16.9-34 inch equipment. A remote hydraulic cylinder, Roll-Gard, and weight packages were optional, as well. The three-point hitch could be left off of the tractor for the very frugal. Dual hydraulics could also be obtained for a 4000 as an accessory that would be installed by the dealership, as could different front axles. This lighter, simpler version of the 4020 filled its place well. Deere’s marketing campaign for the tractor portrayed it as a machine that could use your old equipment, but work it faster. Deere advertised the 4000 in this way because of the lighter final drives and axles in the tractor. Deere hoped that farmers would stay away from pulling large implements with the 4000, as it was really built more as a runner than a lugger. Pulling lighter loads faster put less strain and wear on the tractor’s parts than did using the largest implement that the tractor could pull. The 4000 did well in its short first production year. From February to July, 1,799 tractors sold. The farmers who bought them and the dealers who sold them were quite happy with the new tractor, but many wished for more options, preferring the economic efficiency of a tricked-out 4000 to the full convenience of the 4020. To kick off the 1970 model year, Deere introduced a gasoline engine version of the 4000. Some northern farmers decided that they would rather have a tractor that would start during any season than have the added fuel efficiency of the diesel. Deere also added a power differential lock and a long rear axle to the options list, as well as an electric horn, coolant heater, rubber non-skid platform mat, and Power Weight-Transfer Hitch. The expanded options list helped to maintain interest in the 4000 even through a bad economic year for farmers, and 1,939 tractors were sold, a number that translates to about 10 percent of how many 4020s were sold. Deere continued to offer more options for the 4000 for the next model year. The biggest of these was the Power-Shift transmission. More tire sizes and factory-installed dual hydraulics were also added as options. With 2,296 4000s sold in 1971, the tractor’s sales crept up to 25 percent of that of the 4020. Deere went even further in 1972 and allowed nearly every option from the 4020’s list to be equipped on the 4000. Buyers could now have a factory cab put on their tractor, and could include a heater and/or an air conditioner if they desired. By this point, Deere had basically won the battle against IHC for market superiority, due in no small part to the contributions of the 4000. Farmers wanting the very best in comfort, convenience, and ability had the whole of the John Deere line to choose from. Those who were on a slightly tighter budget had the 4000. 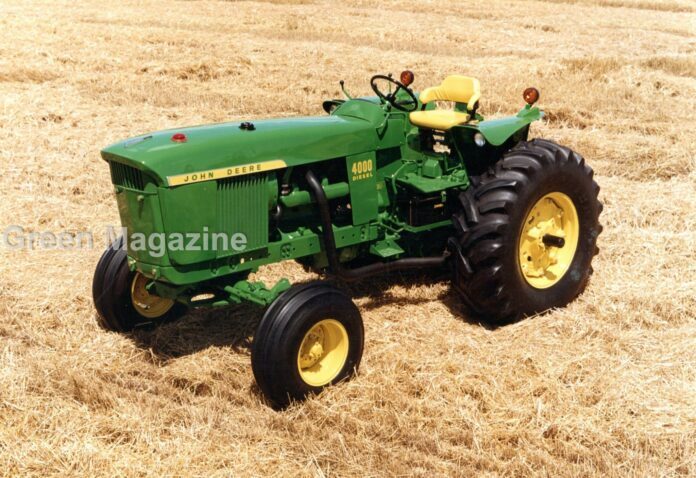 Despite the fact that Deere’s Generation II tractors were just a year away from production, a new version of the 4000, the 4000 Low-Profile tractor, was released during the 1972 model year. This tractor packed all of the features and ability of the 4000 into a more compact, lower to the ground tractor, well suited for grove and orchard operators, and anyone else who needed such a machine. The 4000 Low-Profile took the row crop tractor and replaced the front axle with one from a 3020 row crop utility tractor. This short fixed-tread axle produced a shorter turning radius and lowered the tractor by four inches. 9.5L-15 inch front tires and either 18.4-26 or 18.4-30 inch rear tires offered higher flotation and a lower rear end height. With the use of a seat and seat suspension from Dubuque tractors and the steering column from a 3020 row crop utility, the height of the operator’s station was also lowered. To match this, the fenders were also lowered by 4 inches. A few of the operating levers were modified to keep them from protruding up too far above the tractor, and a new two-piece exhaust manifold was added to allow the installation of a rear exhaust. Another 1,953 model 4000 tractors were sold in 1972, bringing the total up to 7,987. This ended up being the last year of production for the tractor. Nearly 8,000 tractors in four years is a good production number, especially for a low-spec tractor like the 4000. Some of these tractors were probably sold in place of 3020s or 4020s, but many surely stole sales from IHC and other competitors, which was surely one of Deere’s goals in producing this machine. 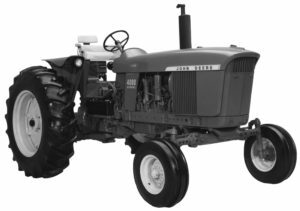 During the 4000’s final year, 46 Low-Profile tractors were sold. Of these, 21 were Syncro-Range tractors and 25 had a Power-Shift. While these numbers look small, even fewer gasoline powered Power-Shift 4000 row crop tractors were sold: 9. There may be a group of 4000s out there that were built in even fewer numbers, though. The 4020 and 4000 tractors were given serial numbers together, with the only difference on the tag being a “B” prefix for the 4000 and a “T” for the 4020. Perusing the Serial Number Register exposes three tractors with the product code “B233R.” These tractors would be model 4000 Hi-Crop tractors. There is no documentation that Deere ever tried to sell such a tractor, so if these really existed they would have been some sort of special order. Granted, there may have been an error in recording these tractors, but, then, there may not have been…. While to some the 4000 may only have a reputation for being a stripped down or simplified version of the 4020, they really had more practical use than that. For a farmer who did not need all of the bells and whistles that a 4020 could provide, the 4000 was the perfect machine. It was nearly as capable, but saved the farmer a substantial amount of money. As the hobby of restoring antique tractors goes forward, eventually more and more people are going to be looking to build collections of this 20 series. When this happens, one of the tough ones to find is going to be the 4000.